This deck excels at playing cards that increase your energy, fueling hyper-powerful Battle Cards to deal huge damage to the opponent. 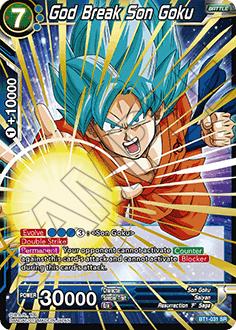 [BT1-031 God Break Son Goku] and [BT1-041 Beerus, General of Demolition] are your aces in the hole, whose high power and incredible skills help overwhelm the opponent. 1.Increase your energy to prepare for the mid-game. 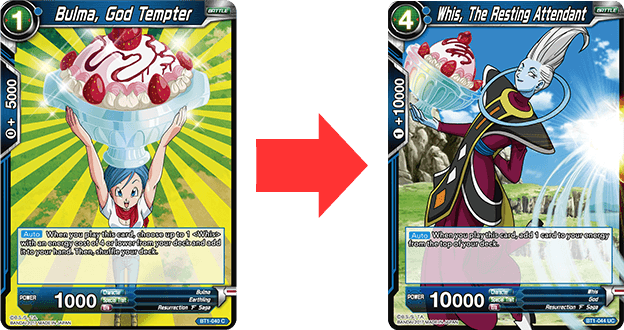 Normally, you can only increase your energy by one each turn, but with [BT1-052 Objection] and [BT1-044 Whis, The Resting Attendant]’s skills you can ramp up your energy production each turn. [BT1-052 Objection] is an extra card that adds a card from your hand to your energy. Play it on your second turn, and you can play a four-cost card the next turn – a turn earlier than normal. Because of how important this card is to the deck’s overall gameplan, it’s worth redrawing your entire hand if your starting hand doesn't have it. [BT1-040 Bulma, God Tempter]’s skill adds [BT1-044 Whis, The Resting Attendant] to your hand, so an optimal game would have you playing [BT1-040 Bulma, God Tempter] on turn one, [BT1-052 Objection] on turn two, leading to [BT1-044 Whis, The Resting Attendant] the following turn, setting you up with an energy base to play powerful Battle Cards far earlier than you should. 2.Overwhelm your opponent with powerful cards! Once you have your energy base set up, it’s time for powerful Battle Cards to take the stage. 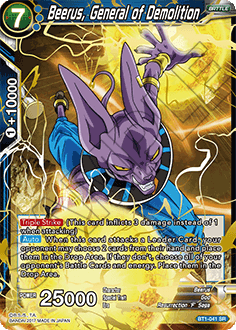 Play super strong battle cards like [BT1-031 God Break Son Goku] and [BT1-041 Beerus, General of Demolition] and go on the attack. You’ll need to rely on cards with [Blocker] and [Counter] to keep your life total safe while building up your energy, but God Break Son Goku nullifies both. While still useful when your opponent’s life total is high, God Break Son Goku really shines once they’re down to two life or less. 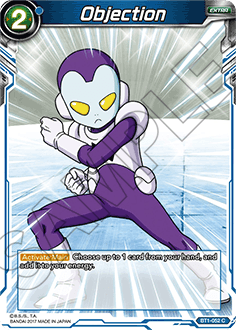 [BT1-041 Beerus, General of Demolition] forces the opponent to lose cards from either their hand or playfield every time he attacks. The fewer cards the opponent has, the harder it is for them to combo, making it harder and harder for them to defend against your offense. It takes a lot of resources to play powerful Battle Cards. Even if you do manage to get them out early, you may find them difficult to defend without energy. As such, using as little energy as possible to deal damage to your opponent is essential. 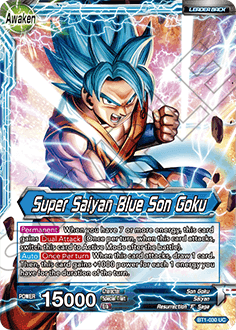 [BT1-030 Super Saiyan Blue Son Goku] gets more powerful the more energy you have, and gains [Dual Attack] when you have seven energy or more. 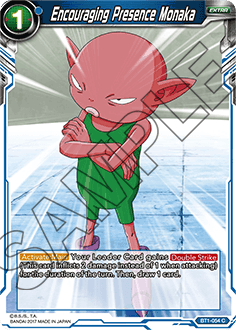 When paired with [BT1-054 Encouraging Presence Monaka], he becomes a fearsome, high-power attacker with both [Double Strike] and [Dual Attack] for the cost of a single energy.